Dislocation of a bone/joint generally requires a high-energy mechanism secondary to native anatomic configuration and strong support of surrounding soft tissue structures. Approach to initial recognition, evaluation, and management of these injuries is crucial toward creating potential for optimal enduring results. 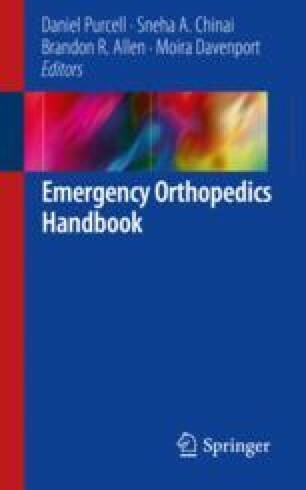 The following chapter will discuss assessment and treatment, as well as provide clinical pearls with respect to emergency room management. Keany JE. Ankle dislocation in emergency medicine. Background, pathophysiology, epidemiology. https://emedicine.medscape.com/article/823087-overview. Published April 28, 2016. Accessed 16 Mar 2018. Davenport M. Reduction of posterior hip dislocation. Background, indications, contraindications. https://emedicine.medscape.com/article/109225-overview. Published February 26, 2018. Accessed 16 Mar 2018. Lent GS. Reduction of radial head dislocation. Background, Indications, Contraindications. https://emedicine.medscape.com/article/80051-overview. Published August 2, 2017. Accessed 16 Mar 2018. Weatherford B. Sternoclavicular dislocation. Sternoclavicular dislocation – trauma – orthobullets. https://www.orthobullets.com/trauma/1009/sternoclavicular-dislocation. Published 2012. Accessed Mar 2017. Mallia AK. Reduction of shoulder dislocation. Background, indications, contraindications. https://emedicine.medscape.com/article/109130-overview. Published August 9, 2017. Accessed 16 Mar 2018. Davenport M. Reduction of ankle dislocation. Background, indications, contraindications. https://emedicine.medscape.com/article/109244-overview. Published February 26, 2018. Accessed 16 Mar 2018.